DISCLAIMER: The thoughts expressed in this article are those of the author alone and do not echo Sportskeeda's views. Sasha Banks and Bayley have been in the news this week for all the wrong reasons. It was reported that a backstage altercation took place at WrestleMania 35, involving the former Women's Tag Team champions and WWE management. A superstar (said to be Dana Brooke) got a busted lip from an accidental backhand. The Boss n Hug Connection was said to be unhappy about losing their titles so soon into their reign to the IIconics, considering that Sasha and Bayley were the ones that pushed for the titles to be introduced. Sasha has apparently requested her release from WWE which was denied. WWE has told her to take a few weeks off to think about leaving. Banks, however, appears to be sticking to her decision as she and her partner have unfollowed WWE on Twitter and are apparently following All Elite Wrestling (AEW), Cody Rhodes, The Young Bucks, and Kenny Omega. I will leave a transcript here and here. 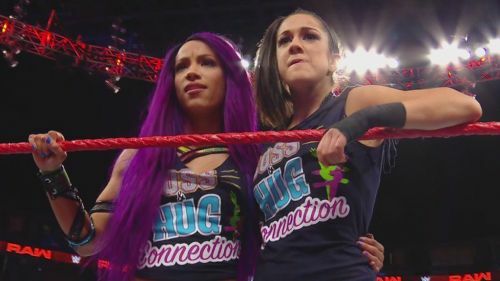 It is not hard to understand why Sasha and Bayley would feel frustrated about it, although there could be a lot more to this than meets the eye. For starters, Bayley has been drafted straight over to Smackdown, while it appears Sasha may stay on Raw (if she decides to come back). Maybe the reason why the backstage incident happened wasn't so much about simply losing the titles, it may have been more about why they were going to lose them, (i.e. getting drafted to different brands). Perhaps they were told sooner that they were going to split up, say at the last minute at WrestleMania 35. It would have caused one or both women to be upset about the sudden change of plans. It would be easy to see why WWE may have decided to split the Boss n Hug Connection because Becky Lynch is going to need some strong, main event caliber challengers and these two are a perfect choice. Becky can't keep challenging Charlotte forever and Ronda Rousey has gone away for a while at least. Also, Asuka is now in a tag team with Kairi Sane, Nia Jax is injured and Alexa Bliss is only wrestling occasionally for the time being. That leaves Becky to have short feuds with Lacey Evans, Natalya, Mickie James, Naomi, Carmella and possibly Nikki Cross. Those feuds will be used until WWE can build up Alexa Bliss, Sasha Banks and Bayley to be credible threats to Lynch. While the storyline could legitimately be a shoot, it seems very unlikely that it is and it is even more unlikely that Banks would want to leave WWE at this stage anyway, considering that the company has made a gigantic leap in the right direction with the Women's Evolution. At this time, WWE is just as focused on the women as the men. There is arguably no hotter place to be in at the moment. Sasha was one of those that helped pave the way for future women in the company. It would not make sense for her to leave, especially after Bayley and Banks managed to convince Vince McMahon to introduce the tag team titles. The Legit Boss and The Hugger are both being underutilized on the main roster, despite their previous title reigns. Some may say that neither has anything left to prove but I say different. As pioneers of the change that has happened in women's wrestling, it is their job to continue to make sure the women's division stays a focal point for years to come. They need to continue to help the other women to break boundaries and set the standards, in which men need to achieve. If Sasha was to leave, WWE would not acknowledge the NXT Takeover match that Banks and Bayley had, which broke all barriers for the division and kick-started the Women's Revolution. The match was proof that women could wrestle just as good as the men. It certainly was a groundbreaking moment in history and it would not be given the credit it deserves on WWE TV again, if Banks really did go to another company. If Vince has any doubts of whether these women deserve to be champions, I suggest he takes a look at the chemistry in their matches that Banks and Bayley had together as opponents. At the end of the day, the company knows they need to hold onto Sasha and Bayley. They would have resolved the issue fairly quickly, probably by promising both women a huge push and possible Women's championship run. Either of the two being in a rivalry with Becky is certainly something we haven't seen yet. One would imagine these to be long, drawn-out rivalries, much like the Charlotte/ Becky/ Ronda feud. I must admit that if this is indeed the direction, we can certainly expect it to be entertaining and personal.